Check your email after registering to login. Step 1: Simply register above to start using DMCA.com Facebook WaterMarker. It's FREE. Step 2: check your email for login password. Step 3: Go to the DMCA Facebook Protection Login and follow the simple set up instructions. Why use DMCA.com Facebook WaterMarker? Everyday DMCA.com conducts Takedowns for social media users who find their personal pictures on personal "exposure" websites intended to embarrass or harass. Often the source of these personal pictures are online social media profiles. DMCA.com developers and DMCA.com takedown professionals got together to help users of the largest social media platform in the world reduce the theft of their content. Stop "Copy and Paste" thieves deter thieves from stealing your personal pictures. While it is virtually impossible to prevent theft of content within the social media space, decreasing the chances your personal photos gets published on the internet where you don't want it to be, is a good thing. DMCA.com Facebook Photo Watermarker is one of those preventative actions you can take to increase your protection and decrease your chances of being an online victim of picture re-publication. If thieves do steal your pictures and publish them without your permission, it's far easier and faster to get them removed if they have been watermarked. Many businesses are now using social media - in particular facebook - to reach out, stay in touch and connect with their clients or consumers. Everyday DMCA.com takedown professionals are helping companies or organizations get photos or marketing collateral removed from online locations they were never intended to be published on. Much of this content has come from social media profiles. Other groups, organizations or small businesses have replaced the conventional website with a social media page. They now reach their users, clients, customers exclusively through social media. Communicating, marketing and advertising their content without protection can leave these groups exposed to content / copyright infringement with unintended purposes. The DMCA.com Facebook Protection goes a long way to increase their security in doing business within social media. Watermark your sales, marketing or advertising collateral with your corporate logo and name. Watermark your event, function, convention, tradeshow photos with your corporate logo and name. Protecting them from being used by the competition or another group. Once logged in and with your permission, DMCA.com connects to your Facebook account to reference your list of photo albums. You choose which albums you want WaterMarked by selecting "WaterMark this Album"
DMCA.com creates a cloned photo album. Your original photos remain untouched - Your original album remains completely intact. You then enter your Copyright/WaterMark text. Generally this is your name, your company or business name or some other differentiating text. Click "Submit" and DMCA.com watermarks all the photos within your new Album. In your facebook setting you now select the photos from your new watermarked folder as the album to share with friends. Change the privacy (display) settings of the unwatermaked photo albums so only the groups or "friends" you trust can view them - or so no one can view them or you can delete / download them all together from your facebook account. 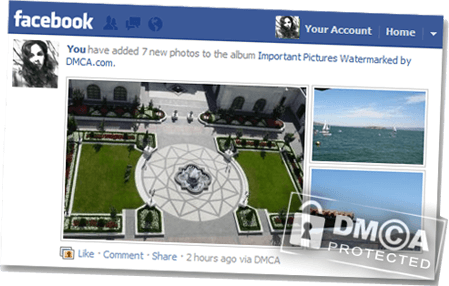 Start Protecting your Facebook Photos with the DMCA.com facebook WaterMarker!